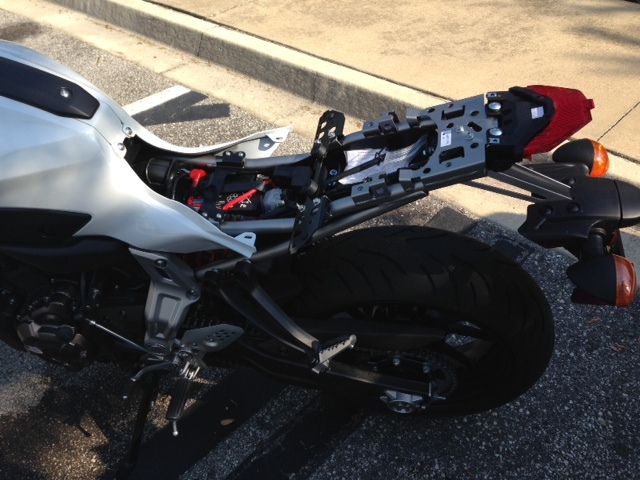 What did you do to your Yamaha FZ-07 today? Finished installing the rear rack, and posted pics in the forum garage, also got pics of the front cowl. Too many beers to ride, that rack was afour beer project, that took 2 days....better pick up a twelver if u r gonna put a rack on this bike lol. Got about 225 miles ... changed my oil for the first time. No surprises, except the oil lug nut was much tighter than I would have expected. Everything is easily accessible. Nothing remarkable about the old oil. Installed a horn and cleaned lubwd and adj chain. Went for a ride with my son 2. While doing my Mesh Install I decided to do some mouse prevention. I added some mesh to the air intake. I don't want those little critters in my bike. One already started building a nest on top of my tool bag. I had put some bounce sheets on it yesterday (I read somewhere that mice don't like the smell) but this one apparently didn't mind because he was using it as nest material. So now I have some moth balls there. Maybe that will help. Tips are welcome. I just hate those pests! Handed the keys to someone I met 5 minutes before and said goodbye to my bike for two weeks. Wow, two weeks. But just imagine what you will be getting back! Do you have any dyno numbers you can share or do we have to wait for the "before and after" thread? Will have to wait, they threw it on the dyno real quick, but were still getting everything set up to actually monitor everything. I actually forgot to confirm that I'll be able to get reports back, but since that's kind of the point of a dyno I'm sure it won't be a problem. And it sounds like I'll likely be reporting back on stock vs. Exhaust/EJK Fuel Controller. Matt told me about you. I did the same with rhe FZ09. Great pepple to work with, 100% professionals! End up with a fantastic product on the 09 and very easy to adapt to different exhaust set up. Good on you, a 2 weeks away well spend! No, I had to do that hard work myself. Matt did a great job putting something together and with some hard work and some luck we hit the sweet spot. Hardest part is the base set up. Afterward all you need to do is trim here and there for different exhaust. You'll like it! Won't be surprise you end up with a 2 cylinder version of mine... or close to. Me and my baby went for a short ride in the mountains. That's some nice scenery kilfafornia and the bike looks great! Thanks man! I'm trying to beat your photo. I'll bring that bike to Big Bear one of these days, the background is gonna be a lot better over there. I'm hoping it's gonna be the first FZ-07 up there too. I am picking up my fz from the dealership! I did my first oil change and lubed my chain I got 500 miles on her. I also check my chain it looked loose not sure how to measure it I went from the bottom of the swing arm to the center of the chain it was 55mm when I pulled on it? Really clean eddy, looks great. Where did you pick it up? It's been on the list, really helpful to see it on the bike. And what tail lights you go with? Any issues? No issues. Blinkers are RG Micro LEDs (RG371). Was about a 2.5 hour job after getting the right tools and working slowly and steadily. Only troubleshooting was hooking up the blinkers to the correct plugs - had to re-wire all the male adaptors on the blinkers/tail light and they got a little mixed up. Tried a few wire combos and eventually all was working perfectly. And oh yea - I purchased from Twisted Throttle. Gave them a ring on the phone because it wasn't listed online. These bikes look so much better with this. Took the warning label off the tank (what a pain) and added my HID's. Keep the rubber side down and the shiny side up.